Finding the perfect mix of oceanfront and privacy for a larger family can be difficult at times, but Coconut Villa makes it easier. The villa’s freshwater pool, al fresco dining area, and family suite give space to connect indoors and out. Enjoy the privacy of your own beachfront property whether you lounge poolside, take your own tropical drinks to your beach-side space, or create snorkeling memories. Make sure to wear pool shoes or fins when you go in the water! With lush landscaping and an oceanfront cabana, you’ll feel like you’re in your own secret garden by the sea. Just steps from great snorkeling and the ocean! Coconut Beach is located steps from the beach along the Rum Point coast. This large, one-story villa offers excellent snorkeling, a detached apartment, and central air-conditioning. This villa sits directly on the beach, making it an ideal location for those who want to snorkel extensively or spend their day on the sand. A wraparound checkerboard patio with a cabana surrounds the freshwater plunge pool and leads to an outdoor shower. A hammock and swing offer space to read a good book, enjoy the ocean view, or take a nap. There are also two tandem kayaks available for a discounted rental, and a waiver is required. The villa’s interior is flooded with Caribbean sunshine through several oceanfront windows in the main living area. The common area has an airy, open floor plan and includes two dining tables, the living room, and the kitchen. The living room has a flatscreen TV and plush couches. The dining table seats 8, a separate children’s table offers kid-sized benches, and there’s bar seating along the kitchen countertop. Sofas and adirondack chairs are in the adjacent sunroom for lounging, reading, and sunset cocktails. There’s also a full bathroom with a tub and shower off the common area. Coconut Beach has two oceanfront king suites with sliding doors that open to the patio. The queen suite has a private bathroom, and two twin bedrooms each have access to a bathroom. The twin beds in both suites can be converted into a king bed upon request. There’s also an optional sixth bedroom above the garage. This suite has a queen bed, a full kitchen, a wall-mounted TV, a large fridge, a loveseat and a bathroom. 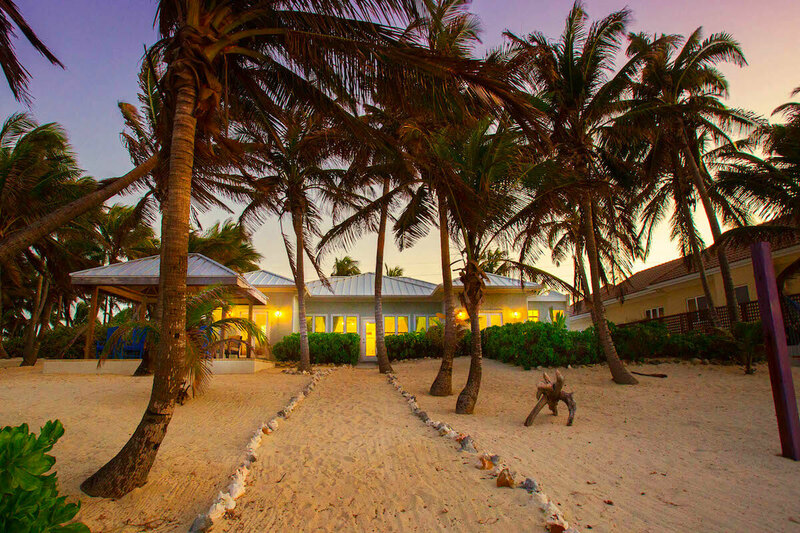 Rum Point is home to several upscale villas and a Beach Club with dining and activities. This villa is perfect for a few families who want to vacation together.